Having finally shaken the inevitable and late-onset case of the ubiquitous and inevitable “nerd flu” (the trademark illness of Comic-Con), we’re back with another Movie Monday podcast. Today we tackle “Captain America: The First Avenger,” the origin story of the most unflinchingly patriotic of Marvel superheroes. The film is set in a plausible but still fantastic period in American history, as the “Star-Spangled Man” takes on the most classic of baddies: power-hungry Nazis. 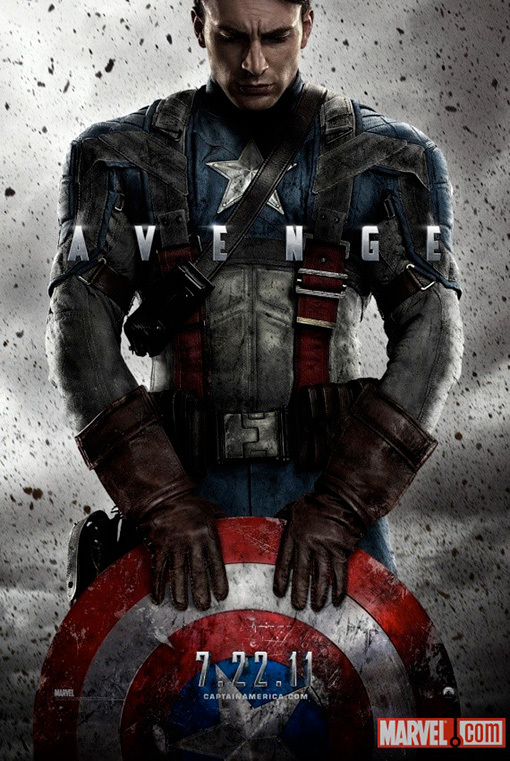 The film stars Chris Evans, Hugo Weaving, Tommy Lee Jones, Stanley Tucci, and Hayley Atwell. Grievously omitted from our discussion was the character of Howard Stark, played by Dominic Cooper, who provided a great and necessary link between the world of “Captain America” and the contemporary Marvel superheroes (and superhero movies). Of course, we’re not well versed in the comic book world, which we amply demonstrate in our review. So what else did we miss? What did “Captain America” get right, or wrong, in this fifth installment in the Marvel cinematic universe? This entry was posted by Ryan on August 7, 2011 at 4:39 pm, and is filed under Movies, Podcasts. Follow any responses to this post through RSS 2.0. You can leave a response or trackback from your own site. I read lots of comic books growing up, but mostly in the DC Universe rather than Marvel. As such, I didn’t know the full back story of Captain America, but was drawn to the movie by its highly effective marketing campaign. And by my disappointment in the rest of this summer’s superhero films (I’m talking about you especially, Green Lantern). After seeing it, I went to the web to learn more about the history of Captain America, and there I picked up all sorts of useful information about the various characters in the film. This profoundly enriched both my understanding of the movie and my appreciation for it. In the podcast, you alluded to the fact that you weren’t well versed in the Captain America mythology before seeing the movie, and there’s certainly nothing wrong with that. Given that you guys are putting yourselves out in public through your podcasts, in similar future scenarios, might I suggest that you would gain a lot from a bit of follow-on research to get a bit more understanding about a movie before starting the recorder? That said, I’m glad that the regular format Popspotting is back on the air. Thanks! We always do a fair amount of research before starting the recorder. You note that we did disclaim we’re not deeply immersed in this universe. But I think as much as a film might be “fan service” to people who know this world, it should also stand on its own, which is I think one of the muddled points we made. It’s clear “Captain America” was wonderful to anyone who loves “Captain America,” but obviously it was a tougher sell for newbies. We can only speak from our own perspective, which admittedly may not be as well-versed in specific topics as some of our listeners. Thanks for your comment. I’m sorry we made you turn off the podcast! Actually, I am confident that Dum Dum Dugan and all of these Howling Commandoes are fantastic characters. In fact, what I said was, I’d rather have spent more time learning about them, rather than watching battle montages. I was intrigued by what was hinted at, and I wish I tasted more of what you’re saying than what we got. And I certainly meant no disrespect to Dum Dum, I actually liked the idea of him. I just thought the actor might have overplayed his hand in a role that’s already pretty big. And I would offer that the movie stands on its own pretty well, with $250 million in worldwide box office receipts to date and Rotten Tomatoes scores of 79% (critics) and 80% (fans). I feel confident in assuming that all of that audience did not consist of Marvel fanboys. Or girls. I’m simply saying that my experience was enriched – after the fact – by the additional information that I obtained. Well, it’s patently ridiculous to use box office performance as a measure of the quality of a film. (If anything, maybe we’re just being silly reviewing a film that half of America is going to see, regardless of anyone’s opinion!) And we’re not going to temper our opinions because other critics’ opinions differ. That said, we LIKED “Captain America.” We’re glad we saw it. We scored it 7/10, which is actually in line with Rotten Tomatoes’ aggregate score. We had a good time with it, even as we admitted right up front that we might not have understood every nuance of the Marvel backstory. If anything, researching the Howling Commandos and Captain America after the fact, as you are recommending, made me wish there was more of that character background in the movie, and perhaps less of the pyrotechnics. I thought I was engaging in a civil dialogue, as we have many times before. Now I’ve been called out as patently ridiculous. Okay. I’m done talking. I thought I was too, David. I’m sorry. I thought it was clear that I’m not calling YOU patently ridiculous. It’s just that pulling out box office numbers to say a movie is good is… just not the best argument. “Smurfs” made millions, too, you know? Obviously, I need to use more smileys! I think we’re actually saying much of the same things. All the rich backstory that we didn’t get from the movie? I’d like to have seen more of that in the movie. I think there was room for it. But ultimately, we gave our non-trademark-infringing thumbs up to “Captain America.” You liked it, we liked it. Obviously we could’ve liked it a lot more had we known more. I’m not up on all the lore on Dum Dum Dugan, but the interesting thing is to compare Neal McDonough’s performance in a WWII Comic character and that of the real life person of Buck Compton in the Epic Band of Brothers series. He played that role very well. It would be interesting to hear from some one who knows the lore of Dum Dum see if how well help played it. On another note Band of Brothers is one of my favorite series of all time. In fact I just bought it again, this time on Blu-Ray. It is a worthy watch for y’all some time. Loved that you guys reviewed Captain America. As I mentioned on Twitter it’s actually one of my favorite movies of this summer (along with X-Men). I think that mainly because it surpassed a lot of my expectations–which I’ll be honest, weren’t too high as I had heard that Thor was going to be better than Capt America in early reviews of both films. Though I respectfully disagree with some of your guys’ thoughts of the film, overall it worked for me and I had fun with it. I thought Chris Evans was pretty good in the title role and though I somewhat agree that someone else could have been there as well, for him being “the guy” I thought he did well. To me he really did embody what I had previously perceived Capt America to be, from the way he carried himself to the way he fought. In regards to the Hydra lasers taking you and Jen out of the film . . . I can definitely understand that. I think if the lasers had a more limited role (maybe to just tanks?) it might have been a little easer to swallow. I also agree with you that these films need to stand on their own outside of the comics (as any book/printed adaptation should). Now, I haven’t read any Capt America comics, but I did have a rudimentary knowledge of this character, his background, and a few other characters that played a part in his WWII backstory, and from what they presented in the film, I thought they got the basics pretty spot on. (and when I say basics, I mean the basic story that people unfamiliar with the character should have to know what Capt America is all about). If there was a Filmspotting Sophie’s Choice type poll between Capt America and X-Men First Class, it would definitely be hard for me to decide. In the end, I’d probably go with Capt America by a nose–mainly because I know his story is part of the larger whole that will be next summer’s Avengers. On a somewhat side-note, I think another reason why I liked this film was because the director, Joe Johnston, directed another “superhero” origin film that I liked as well–one of the first actually. He also directed 1991’s Rocketeer. OMG, I don’t want you to think that I stopped listening to the podcast, I didn’t… I just meant this individual one because it was hard to hear the criticism of one of my favorite comic book characters. Again, it wasn’t a slant against you so much as it was just hard for me to hear it. Again, love your show now as much as I loved The Transmission. As someone who knows Dum Dum, I think he was played fairly true to form, thus I was a miffed that you didn’t get that. Again, not your fault, you don’t knkow the character, but I was truly happy with the overall performacne and the sentiment of the movie itself. Trust me, I’m a fan of the show and always wil be. Heh. No worries, I knew you meant you had to turn off this episode. I’ve done the same when the hosts are clearly flailing about in waters they know nothing about! I’m glad you’re enjoying Popspotting, as different as it is from The Transmission. We hope to hear from you often! Well stated Geoff. McDonough’s been on my watch list, as has several of the Band of Brothers cast, much the same as after the Stand I kept an eye on Sinise, Sheridan and Fagerbakke. Dum Dum was VERY broad in the comics… translating him to movies is a challenge I’m glad I didn’t have to face.